Welcome to our school website which will give you an introduction to the life of our happy and successful school, which has been serving the Catholic community in Dollis Hill for 50 years. We believe that the years spent in Primary School are amongst the most important in every child’s education. 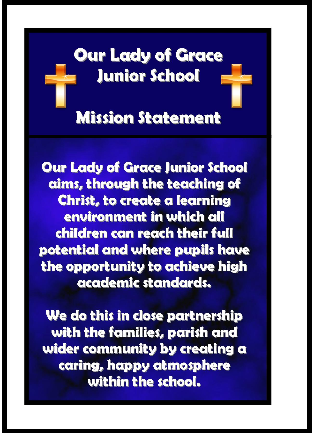 Therefore, at Our Lady of Grace Catholic Junior School, we aim to provide the best possible opportunities and environment for your child to reach his or her potential in all aspects of school life (spiritual, moral, academic and social). We aim to provide enjoyment and challenge for all learners, across all curriculum areas, and ask the pupils and parents to embrace these challenges and see them as a genuine chance to progress. We aim to provide a happy, caring, secure and stimulating environment in which all the children will feel confident about themselves and the world about them and to grow in faith and understanding. We provide opportunities for parental involvement in the life of the school to encourage a real collaboration and co-operation between the Parish, Governors, teachers, parents and children. We believe this to be encapsulated in our Mission Statement below. 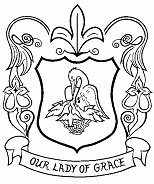 At Our Lady of Grace, we expect high standards of conduct from all members of our school community and place considerable emphasis on treating each other with kindness and respect. We have an experienced, well-qualified, committed and talented teaching staff that allows us to be confident that we can fulfil our promises to our parents; and we are well-resourced in terms of books, equipment and ICT resources. We believe that the video below represents what our school is like, we hope you enjoy it and thank-you for taking the time to visit our website.